We are Tilbury & Essex Funeral Directors in Tilbury. We are here to provide your loved one with a bespoke funeral service that will give them a dignified and respectful farewell. It is with compassion and care that our professionals will tend to the departed, and we offer you our full support and guidance during the difficult time after the loss of someone close. Our Essex funeral directors cater for religious and non-religious preferences, and it is paramount to us that everyone in our care is treated with kindness and integrity. 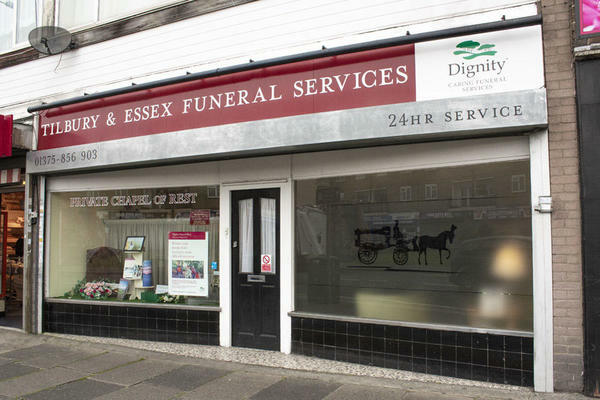 You can depend on Tilbury & Essex Funeral Directors to take care of all your funeral needs and wishes, so please call us as soon as you need our assistance. Call us today on 01375 856903 to talk through your personal requirements. At Tilbury & Essex Funeral Directors, we understand how special life is with those that you love. For us, every funeral is unique and personal. We have a service to fulfil every wish, with every detail carried out with the same uncompromising quality of care. From a traditional service, to a colourful woodland burial, your options are limitless with our Full Service Funeral. If you have a little more flexibility when it comes to arrangements, then we can provide a Simple Funeral for a lower cost. We are next door to florist near traffic lights. Our staff are available 24 hours a day on 01375 856903 if you require our services outside of these hours. The service provided by all staff was superb.They were very supportive in every way and offered us optional extras to my Mum's funeral plan with no pressure to take them. I would thoroughly reccomend their services should you be in the position to need them. Thank you for taking the time to share your thoughts with us. I am pleased that we were able to look after you and your family at this difficult time.